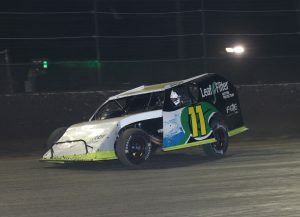 BARBERVILLE, Fla. — With more than 100 cars on hand, five DIRTcar UMP Modified 15-lap features were run during Friday night’s edition of the 48th annual DIRTcar Nationals at Volusia Speedway Park. The Five-Star 15s saw five first time feature winners take home a coveted Gator trophy. The big winner was R.C. 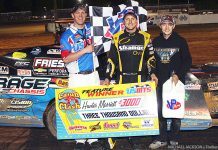 Whitwell, who brought home the victory in the fifth and final Five-Star 15 for the top points earners entering the night in the DIRTcar UMP Modifieds. Whitwell, who started on the pole, paced the field early, with Lucas Lee, who started in third, passing outside front row starter Allen Weisser. Whitwell and Lee pulled away from the pack, with Whitwell slowly but surely getting away from Lee, who had to deal with a hard-charging David Stremme, who started fourth. Stremme got passed Lee briefly but soon lost the spot back to him. 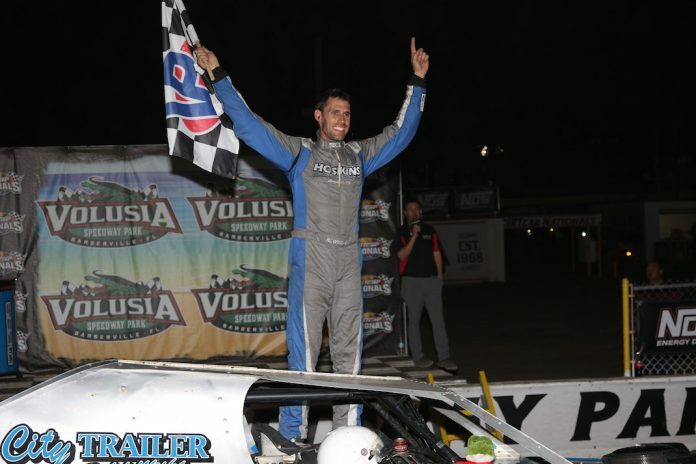 Lee set his sights on Whitwell and got close to the race-long leader but couldn’t mount a serious charge as Whitwell stayed out front the entire race while withstanding a final charge from Lee to secure his first career win at Volusia. Lee settled for second while Stremme completed the podium finishers in third. 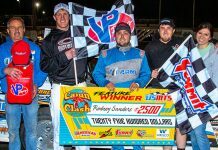 Current DIRTcar Nationals points leader and three-time defending champion in the DIRTcar UMP Modifieds at Volusia, Nick Hoffman finished fourth, and Weisser finished fifth to complete the top five. From there, the 19-year-old held on for his first career Gator trophy. Shon Flannery wound up in second after starting in 10th ahead of Wallace as Collins and Neiheiser rounded out the top five. The middle stanza saw Chad Roush and Mike Learman bring the starting field to the green flag, but it was DIRTcar Summer Nationals star Gordy Gundaker, who started third, charging out to the early race lead. Gundaker set a torrid pace, but Roush, who recoiled, slowly caught back up to Gundaker and passed him back for the lead with four laps to go. As the checkered flag was about to come out, Roush spun his mount coming out of turn four. This set up a Green/White restart with Gundaker back out front and Dylan Stephens, who started 18th, trailing. On that final restart, Gundaker was able to get away from Stephens and the 26-year-old hung on to claim his first career Gator Trophy. Stephens settled for second after advancing 16 positions, while Paul Miles, Brad Waits, who started 13th, and Michael McGee completed the top five. The second Five-Star 15 feature of the evening, held prior to the World of Outlaws NOS Energy Drink Sprint Car Series main event, started with a front row of Brandon Green and Steve Meyer Jr., taking the green flag. Green shot out to the lead early in the race while the rest of the field jockeyed for position behind him. Green was never seriously challenged the entire race and coasted to his first Gator triumph. Meyer Jr. fell back within the top five during the race, but would rebound to finish second with Josh Harris who started 11th, completed the podium finishers. Austin Holcombe, who started 14th and the youngest driver on the property, 14-year-old Hunt Gossum, started 10th and advanced five spots to finish off the top five. The first Five-Star 15 of the night saw Bobby Miles and Jesse Rupe bring the field down to Chief Starter David Farney’s green flag. Rupe rocketed out to the early race lead. Rupe was on cruise control until five laps to go when Dale Kelley, who started deep in the field in 16th and Robert Poole mounted a late charge at the race long leader. Rupe was up to the challenge though as the 25-year-old staved off the advances of his two pursuers to grab his first career Gator. 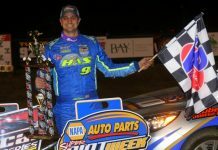 Kelley did move up 14 positions to claim the runner-up spot over Poole while 2018 Eldora Speedway champion Jonathan Taylor, from 15th and Will Norris were the top five.